we are in process of migrating users (mailbox) from on-prem to office 365 (Cloud).As part of this project ,one of the requirement is to deploy office 365 proplus (C2R) application to all users replacing old version of Microsoft Office. We use Powershell Application deployment kit which simplifies the complex scripting challenges of deploying applications in the enterprise, provides a consistent deployment experience and improves installation success rates. Once users have got office 365 proplus and other office 365 components like Microsoft Teams,yammer,Onedrive etc ,there will be final task to migrate user mailbox to cloud. Mailbox migration can be the first or middle or last ,no sequence as it is independent task. 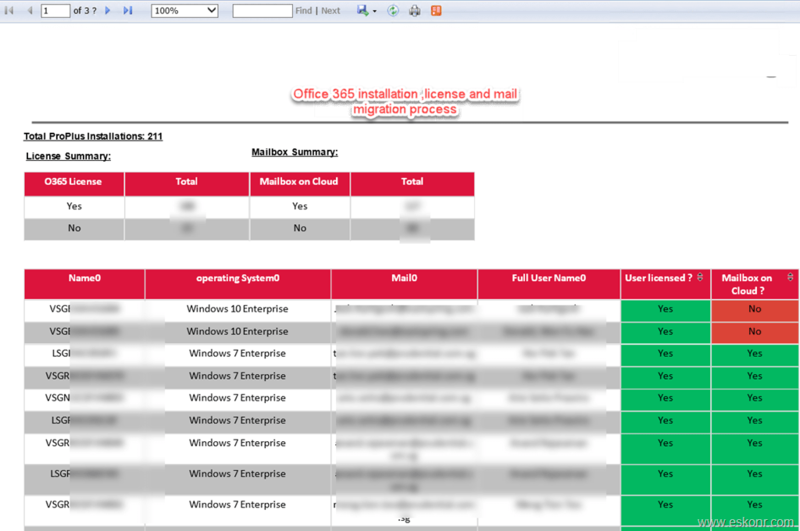 Deployment of office proplus and other components are done by SCCM hence we can create some nice dashboard /reports to monitor the progress of the deployments, but for some reason ,we are missing the mailbox migration status which happens from on-prem exchange server to exchange online (EOL). 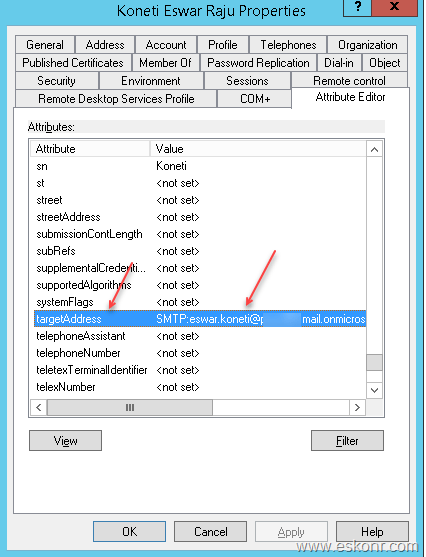 How do we get the status of mailbox migration from on-prem to exchange online using SCCM ? I am not exchange guy, hence i may not be able to provide much information about the theory behind this and if any questions around exchange online or mailbox migration ,you can reach out to TechNet forums or contact Microsoft support. when the mailbox is moved (sync and cutover) from on-prem to exchange online ,there are couple of attributes that are set in Active directory .some of them are listed below. For example ,user email address is Demo1@eskor.com and after the migration ,targetAddress is set to Demo1@koneti.mail.onmicrosoft.com (where koneti is my tenant name). Once this attribute is stamped with cloud email ,we can use SCCM to discover this attribute using AD user discovery and put that info in SSRS report. 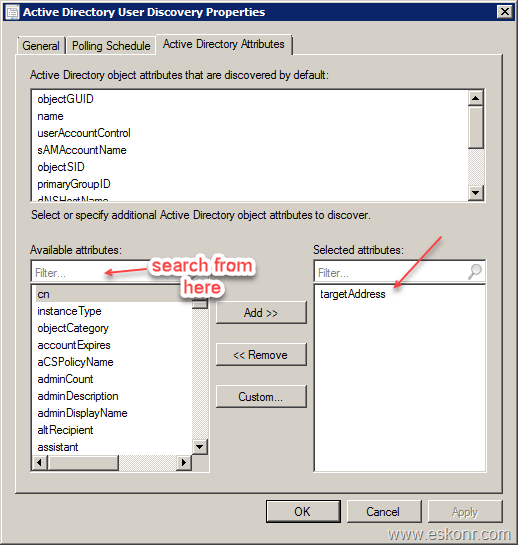 A quick way to view an objects Active Directory targetAddress attribute is through the Active Directory Users and Computers panel. In AD Users and Computers, ensure that Advanced Features has been enabled under the View menu. How do we discover this attribute into SCCM ? Go to your SCCM console ,Administration,Hierarchy configuration ,discovery method and choose Active Directory User Discovery. Once this is done, you will need to wait for the user discovery happen (delta discovery ) or you can force the discovery cycle by right click on discovery method. After the discovery runs, you will have targetaddress0 in v_r_user SQL view to create nice SSRS reports. couple of SQL views that i used to create SSRS report with office 365 proplus installation ,user mail,user name,cloud information and user group are listed below. Even though the report is more customized as per the client requirement ,lot of people have requested in the comments section to post the SQL query so they can modify it as per their needs. O365 license is based on AD sec groups hence if the user is member of AD sec group then we treat user as o365 licensed. Collection ID is user collection ID . Proplus installation is stored in v_GS_OFFICE365PROPLUSCONFIGURATIONS .So if this class is not enabled of for in client settings ,you must enable it. In Current branch ,this is enabled by default . Workplace join is utility that does hybrid azure AD join and for windows 10 ,it is inbuilt but there is GPO to be enabled for this . Domain eskonr is domain name that need to specify. 10 Responses to "Using SCCM how to check if the user mailbox is migrated to exchange online (cloud) from on-prem exchange"
Hi Eswar, Did you post the report somewhere for us to look at? No not yet but i will remove the company customization that i am working for and post the SQL code very soon to this post. Hi Eswar, Did you post the query somewhere? We also user AD groups for our licensing and would like to use a report like this to track the status. will post it very soon in next couple of days. thanks again on this article. Sure ,i can try to explain more about how the report is made of and what basis i would consider user is licensed and mailbox is on cloud. I will try to update the blogpost in this week mostly. Yes ,i do have SQL code but it has lot of customizations based on AD sec group for licensing if user part of the license group then consider user as o365 license else No which may not be the case for everyone so i did not post the sql code but i try to explain so you can create based on your needs. Hi Eswar , Do you have SQL query also ? I am looking for SQL query. Are you willing to share ? Yes ,i do have but it has lot of customizations based on AD sec group for licensing if user part of the license group then consider user as o365 license else No which may not be the case for everyone so i did not post the sql code. Thanks for reply, It would be great if you are able to share with me. I already changed and configured all required AD settings. General query is already structured but stuck in mail box summary. If possible please send me query on my mail.